California Road Trip: Golf, Wine and . . . I Don’t Remember! Saturday – Depart Orange County at 7:30 a.m. Roadies included Jack & JJ Budd, John & Judy VanBoxmeer and Linda and me; Chuck and Linda Sager were scheduled to go on this boondoggle, but a death in the family prevented their attendance. 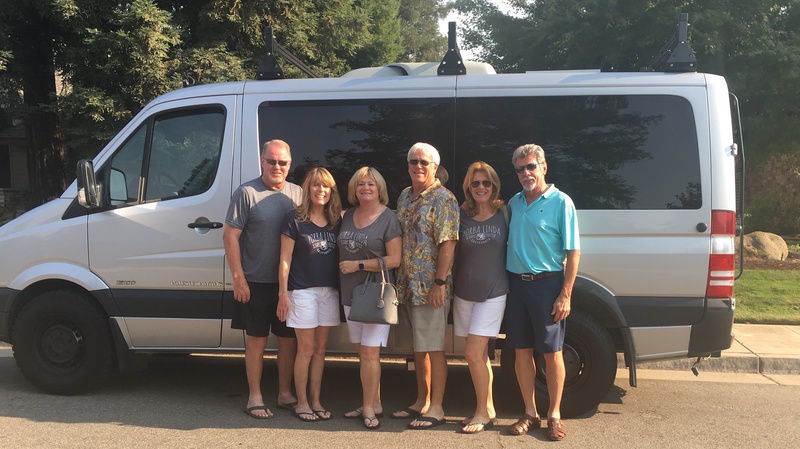 A special ‘Thank You!’ to Ron Erickson, a local Mercedes dealer, who GAVE us a Mercedes Sprinter van to use. It was awesome, as it allowed us all to ride together and annoy each other every minute of the trip. First stop, Alisal’s Ranch golf course, just outside the quaint Danish town of Solvang. The course was beautiful and well managed, unlike my golf game, which was ugly and mismanaged, but beautiful white oak trees provided plenty of shade on this warm summer afternoon and the cold beer at the end of the round tasted particularly good. Fortunately I still know how to play the 19th hole very well! 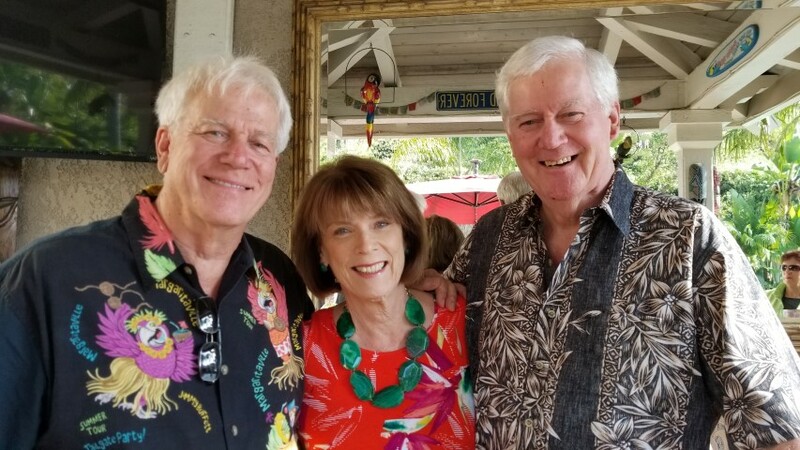 restaurant made famous by the classic movie, Sideways, but we ended up eating at another well-known restaurant in Santa Ynez, The Brother’s Red Barn – excellent beef and seafood in rustic surroundings. 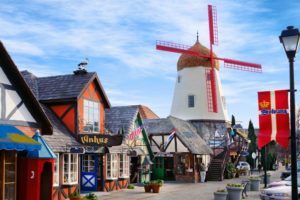 Sunday – Up early for breakfast at Paula’s Pancake House in tourist-filled Solvang, then golf at the River course in Alisal. Scores are not important, although I should mentioned that I once again played the 19th hole particularly well. The evening was spent on ‘The Square’ in Paso Robles – a spot filled with great watering holes and restaurants. 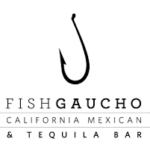 We ate at what was clearly the most popular restaurant in town, based on the waiting time on a Sunday night, Fish Gaucho, which loosely translates to ‘Fish Cowboy’ – excellent food, service and ambiance. Prior to eating dinner we had stopped at another bar (surprise!) and were told by our server, Summer about a ‘Speak Easy’ in town. She said all you have to do is go down the street and around the corner, behind this building and look for a door with gas lamps over it and no name. There will be a doorbell to ring and then someone will open the ‘peep hole’ and maybe let you in. 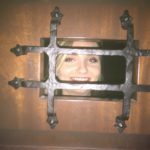 After dinner we did just that and Candice’s face appeared in the ‘peep hole’, we said, “Summer sent us”. She let us in. The place, called ‘1122’, because the address is 1122 Railroad Ave, has only been open for just over a month and is run by four young men who come from different parts of the country, bringing with them their special mixology talent that makes for a most creative drink menu, many of which required heat, smoke and/or fire. Mine, at left, required the harvesting of an entire mint farm. Monday – Breakfast at Joe’s Place, a restaurant that describes itself as a greasy spoon, hole in the wall – great breakfast, sassy waitresses. Then to Daou Winery, which offers great wines and even greater views of the Paso Robles valley. We were given a tour and history of the winery and then sat down for cheese and charcuterie (I didn’t know what it meant either, but I was embarrassed to ask – it’s chorizo, berries, prosciutto, pate, etc., served with cheese and ‘paired’ with various wines). Daou is a MUST if you’re visiting wineries in Paso Robles. 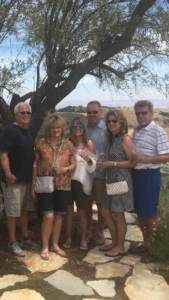 In contrast to the 115 acre Daou Winery, our next stop was a the 11 acre boutique Pelletiere Winery that specializes in Italian wines – great tasting experience, where I found a wine combining my two favorite grapes, Sangiovese and Zinfandel – Magnifico! Leaving the Central Coast for Sonoma/Napa. To be continued . . . In 1986 I stood atop the 11, 053 foot Cornice Bowl at Mammoth Mountain, skis strapped to my feet and my heart in my throat. As I peered down the 2.100 foot drop I was simultaneously petrified and thrilled. I was in my mid-30’s and I knew that if I was ever going to conquer “The Cornice” the time was now. So, slowly, VERY slowly, I made my way down. When I reached the bottom I bent over in relief and was cheered by people who had watched my descent. Right then I knew it was a moment I’d never forget. To this day it is one of my proudest achievements. 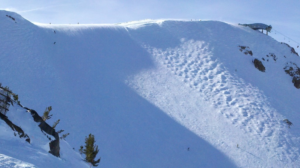 Every year when we visit Mammoth in the summer I gaze up to the Cornice Bowl and marvel that I once skied it. And I thank Dave McCoy. There are few people in business who devote their entire life to the enjoyment of others, but Dave McCoy, founder of Mammoth Mountain, is just such a person. McCoy almost single-handedly turned Mammoth, an extinct volcano in the eastern Sierra Nevada, into one of the premier ski mountains in the world. To me, he epitomizes all that is great about the American Dream. 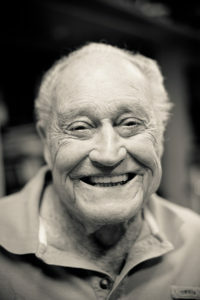 He was born in 1915 to a somewhat dysfunctional family. His parents divorced when he was 13. His mother moved him to Washington but for the next several years he continuously hitch-hiked between there and Independence, California (near Bishop) where he had fallen in love with the scenery and quiet solitude while on vacation a few years previous. He eventually was hired as a hydrographer for the Los Angeles Department of Water and Power. His job was to ski the backcountry, measuring snowpack to predict the following year’s water supply. 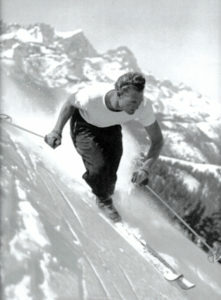 He covered most of Owens Valley sometimes skiing as much as 50 miles per day. His salary was $4 a day, but the truth is, he would have done it for free. He just loved to ski. Dave McCoy in the ’30’s. After World War II record high snowfall in the Eastern Sierras served to attract more and more people from Southern California to ski in the Mammoth area. The Forest Service took notice, asking for bids to develop Mammoth into a ski area. McCoy made his pitch. To his – and our – good fortune, it was the ONLY pitch the Forest Service received. He took a piece of paper and drew three lines, which were for chairlifts. That was the business plan. He always said that the only reason he got the bid was because no one else wanted it. 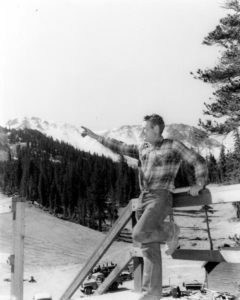 The first chair lift opened on Thanksgiving Day, 1955. Without a college education or formal training in business or engineering, McCoy spent the next 60 years growing Mammoth. For millions of skiers, it was the place to ski. For thousands of employees, it was the place to work. McCoy was doing the impossible and people wanted to be part of it. He was encouraging, supportive and most of all, his mission was for people to have fun. The bottom line was an after thought. 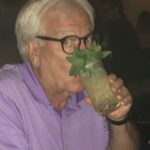 He once told the Los Angeles Times, that skiing had been so good to him at Mammoth, he couldn’t help but to return it to the skiers and see that they had a better place to ski. I can personally attest to his philosophy. One day almost 30 years ago my husband and I were walking in the Main Lodge after a day on the slopes and we passed Dave on a stairwell. He stopped us and said, “Well, did you have fun today?” We assured him that we did. At the time, I just thought he was some friendly guy but my husband recognized him right off and stood there, stunned, in awe of the man he had idolized for so long. Building a ski resort was just a piece of his contributions to Mammoth. He personally spearheaded the effort to incorporate Mammoth Lakes and attract businesses to the area. He was responsible for building a hospital in town. And in 1989 he and a few friends founded The Mammoth Lakes Foundation to be the catalyst in bringing higher education and the arts to the Eastern Sierra. Today, anyone is who has lived in Mono County for at least two years can receive tuition free of charge at the Cerro Coso Community College that the Foundation built. The town is what is it today – all because of Dave McCoy. But in 2005, at the age of 90, he had had enough. The bureaucracy was too much. He commented that he enjoyed running the business as long as he could do the planning and the building and permits were easy to get. But it got to where there were too many regulations and politicians telling him how to do things. It was just too much for this entrepreneurial genius. There is a wonderful bronze statue of Dave in the center of the Village complex in Mammoth. Each year I watch people walk by it, not even stopping to read the plaque that graces the base of it. Little do these people know that but for Dave McCoy, they wouldn’t have the hill they ski, the trails they bike or the restaurants they enjoy in the evenings. It probably bothers me more than it would bother Dave if he witnessed it. On the occasion of his 100th birthday in 2015 he commented, “Life is just what you make of what falls in your lap. “Be happy, make the day happy. It’s all in your attitude, the way you open your eyes in the morning. You got to jump up and go do something.” He’ll be 103 next month and, God willing, this example of the American Spirit will still be doing something. 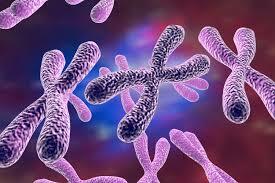 Chromosomes: Like Suzanne’s last blog stated, we were both excited to compare and contrast our DNA. I would say she was right on with the comparisons of personality traits and ethnicity. I would add that the Irish and Germans , which made up nearly 60% of my DNA, have had a fairly friendly relationship over the years, perhaps a little too friendly during the Nazi regime. 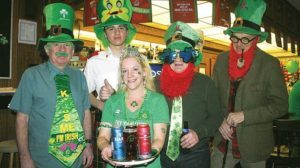 I would add that while the Irish and the Germans both make and like good beer, but they differ dramatically when they’ve had too many – the Irish start singing and the Germans invent a sensor for the automobile that will automatically turn on your windshield wipers when it starts to rain, or they’ll start a war. No wonder I’m constantly confused. As to not having much of a ‘stiff upper lip’, (only 6% British) they say that’s the second thing to go. I will amend one statement that Suzanne made, that being that our DNA tests affirmed “one of us wasn’t a product of mom and the milkman”. However, there still remains the possibility that both of us are – as I recall we did have the same milkman for many years! I have no idea what I just said; but I must confess that I ended up watching the final game between France and Croatia with my nephew, Gene, who along with wife Denise, was visiting from Minnesota, and actually understands soccer, saying he got into it when their son got into it . . . on video games. Gene was up at 6:00 a.m. on Sunday to watch all the pre-game ceremonies. I joined him at 7:30 and became interested in some of the back-stories of the players especially several of the guys from Croatia, who were refugees from their war-torn country. 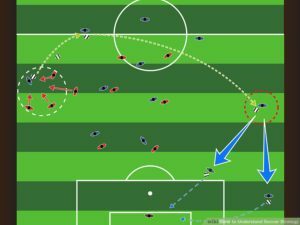 So with some personal information and Gene at my side to answer the multiple questions I had about the rules and strategies as to what was going on out on the ‘pitch’, I ended up actually enjoyed watching the final game. Of course I was rooting for Croatia, who ended up losing the game 4-2. I am making a mental note to get involved earlier in the games next time in Qatar in 2022; perhaps in four years the U.S. can find a way to earn a spot in the tournament. Correction: In the interest of never publishing ‘Fake News’ and correcting errors in a timely manner; in my blog in April 2015, I predicted that L.A. would never have a professional football team. They have one. According to Stanford genetic scientist, Dr. Barry Star in “Stanford at the Tech” website, it logical to assume that brothers and sisters should have the same ancestry background since they both got half their DNA from mom and half from dad. But DNA isn’t passed down from generation to generation in a single block. Not every child gets the same 50% of mom’s DNA and 50% of dad’s DNA, unless they are identical twins. So it’s possible, really probable, for two siblings to have some big differences in their ancestry at the DNA level. Culturally they may each say they are “1/8th Danish” but at the DNA level, one may have no Danish DNA at all. And that, dear readers, summarizes exactly the results that Bob and I got. While he is 22% German, I am only 3%. I am 41% British but he’s only 6% Stiff Upper Lip. I am immensely jealous that he is 36% Irish/Scotch, while I’m a paltry 19%. And while my DNA is 21% Scandinavian, he is just 11%. We also both have a smattering of French, Russian and Iberian Peninsula (which I learned while in Ireland is a result of the Spanish Armada invasion of Ireland in the mid-16th Century). In actual fact, history would tell us that our Scandinavian DNA is also due more to invading marauders in Great Britain and Ireland than to ancestors from those countries. I’ve researched our family tree back hundreds of years and the closest Scandahoovian relatives we have go back at least 15 generations. Given our differences I got to wondering what part, if any, our DNA plays in our personalities. Turns out, that’s a controversial topic, with scholars on both sides arguing divergent facts to prove their point. So I decided to Google what the generally accepted traits assigned to our ethnic backgrounds are to see if I could discern if our inherited cultures influence us in any way. Bob is mostly Irish/Scotch – they are known for strong family values, penetrating wit and laid back lifestyles (which I think is a nice way of saying they spend a lot of time at the pub). I couldn’t describe him more accurately if I tried. He also has a strong German component and they are known for being punctual, efficient and well-organized. The study I read also said they were known for their sense of humor. Wow. Not sure I have met any Germans with a great sense of humor. Then again, Bob is one of the most humorous people I know so perhaps if we can overlook German behavior over the entire 20th Century we can find their funny bones. My mostly British DNA did not surprise me since we have several ancestors who came to the US directly from England. In fact, I’m more surprised that Bob didn’t have more British DNA. The British are known for good manners, witty sense of humor (I think it’s an acquired taste), pride of country, love of a good gin, and friendliness. I think that could describe me pretty well except for when I flip off weaving, texting drivers. Not sure all my British great-grandparents would approve of that. My Scandinavian heritage is the yin to my British yang. Although they also love to drink, Scandinavians are not social, they are in love with “middle of the road” for any decision and their home is their temple. 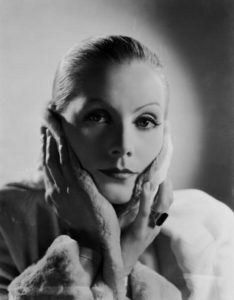 They are perhaps best exemplified by Greta Garbo’s quote, “I want to be alone”. Fits me to a “t” on any given day. I can be a real homebody, perfectly content to curl up with a book, my knitting, a good movie and, of course, Dash the Wonder Dog. I found our results illuminating. Whether DNA really makes a difference in our personalities may never be conclusively determined in our lifetimes but it’s fun to speculate. Now all we need to do is get our brother Jack to spit into a tube. If he comes back as our sibling at least it will let mom off the hook for any rumors about her fooling around with the milkman. Summer brings me this year’s edition of Westways Backyard Bucket List just in time, as I was running out of places to take you. So let’s see what new and exciting things there are to do in SoCal this summer. 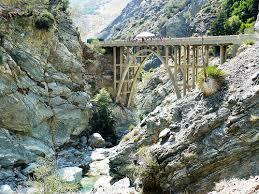 -‘Bungee Jump off a Bridge’ – It starts off with “Hike 5 miles into the Angeles National Forest (and you thought there were only freeways in Los Angeles) to the ‘Bridge to Nowhere’, which presumably inspired our governor to build a ‘Bullet Train to Nowhere’. In the photo shown, due to recent droughts, the bridge no longer spans any water, so if something should go awry with the bungee, you don’t just fall and get wet, you hit the granite riverbed and die. I think I’ll pass on this one. – Visit the old abandoned zoo at Griffith Park – This zoo has not been operational since 1966, but we are told that it once attracted millions of guests. That’s great, if you were here in 1966, but what is there to do now? ‘Visitors can climb behind graffiti-covered metal cages and hike up deserted rock enclosures’. Yeah, that would be so much more fun than going to a zoo that has actual animals? While you’re at it, since it’s not too far, maybe you could stop by Dodger Stadium when the Dodgers are out of town. Check please! –Experience the Bakersfield Sound – I thought Bakersfield was in Texas; I guess it just wished it were. I am informed that there is nightly live music at Buck Owen’s Crystal Palace, but there’s more, you can see Buck’s red, white and blue guitar. Really? No way! Yes, way and there’s still more, you can see Buck’s ‘watermelon suit’ on display. Gosh, I wish it were closer, I’ve always wanted to see a watermelon suit. Honey, go start the car! -Stop for a ‘Bucket List Burger’ – What better way to take a break from completing my ‘bucket list’ list than to visit ‘Bucket List Burgers’ in Riverside. 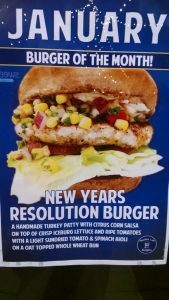 I checked out the menu on line (the New Year’s Resolution Burger looks awesome, I’m getting it, even though it’s the middle of summer), I got directions and with my mouth watering, noticed that it was . . . closed for good! Apparently they weren’t on very many bucket lists. Scratch. -Visit Elvis’s Honeymoon Hideaway – The Palm Springs Modern Tour highlights some of the area’s best midcentury modern architecture, including the ‘House of Tomorrow’ where Elvis and Priscilla lived for a year, until Elvis’s nightstand was completely covered with half-eaten peanut butter, banana and pickle sandwiches. Elvis rented the house for a year in 1967 and the lease is framed and still hangs on the wall. The home went up for sale 3 years ago for $9.5 million, it didn’t sell and is now back on the market for . . . $5.9 million – guess those peanut butter, banana and pickle sandwiches are getting a little crusty. No thank you very much! -And speaking of bananas, here’s something I never knew even existed, the International Banana Museum, and it’s right here in southern California, well not exactly, it’s out in the desert in Mecca, which isn’t the end of the world, but you can see it from there. 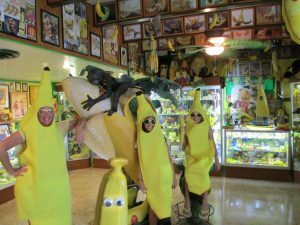 This museum has over 20,000 banana-related items, some to eat. The photo at the left just makes you want to don an outfit and . . . go bananas! Or not! -Visit the Original McDonalds – the magazine says “the ‘unofficial’ McDonald’s museum is located on Route 66 in San Bernardino and provides a nostalgic peek at Golden Arches memorabilia.” Which begs the question, ‘Where is the ‘official’ McDonald’s museum?’ I don’t really care, since I haven’t visited a McDonalds ever, I’m not sure what would draw me to anything McDonalds now, unless I could get one of those plastic life-size statues of Ronald McDonald to put on my front lawn. Super size this!! To be fair, the magazine did offer some destination that I’ve either already visited or will visit, but my real ‘backyard’ bucket list, would start with a cool drink, some music, a spot in my own backyard while imagining I’m on a tropical island – it’s so much cheaper this way! 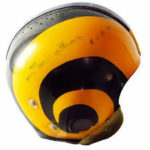 Enter your email address to subscribe to our blog. You'll receive our post each week in your inbox.